Marguerite Dufrost de Lajemmerais, the widow of François Youville, and the three ladies who were helping her with her charitable work among the poor decided to consecrate themselves completely to this task by welcoming anyone in need. According to the testimonies of the first sisters, this consecration was made in secret on 31 December 1737. It should be recalled that new religious communities could not be founded in New France at the time. The existing communities came from France and were financially dependent on the King. Thus, it was not desirable to add another financial burden to the State. During this period, there was no one to take care of women in difficulty, some of whom were disabled, widowed or without family support. This problem was serious because the General Hospital only welcomed men. It is no accident that the first person welcomed by Marguerite d’Youville in the autumn of 1737 was a blind woman in her sixties, the widow Françoise Auzon. Marguerite and her associate Sisters lived and welcomed the poor to the Le Verrier house on Notre Dame Street in Montreal. These charitable ladies did various kinds of handiwork, especially sewing in order to ensure their subsistence. They devoted themselves to contemplation and prayer when they were not caring for their boarders. During the following two years, Marguerite and her little community had to move four times. The Original Commitment of 1745 was signed by Marguerite and her first three associate Sisters. Each Sister of the community has signed the Commitment in her turn up to the present day. The first vows made in 1737 are considered as the founding event of the Sisters of Charity of Montreal, “Grey Nuns”, even if the King only authorized the founding of the new community in 1753. The General Hospital of Montreal, founded by François Charon, had fallen into bankruptcy since the death of its founder. Only two elderly Brothers were attempting as best as they could to care for several poor people who were as ill as they were. The building was in need of major repairs. Finally, the authorities of the Colony decided to appoint Marguerite Lajemmerais, the Widow Youville, as the provisional administrator of the hospital. Henceforth, the institution welcomed women and men alike, poor people, disabled and mentally challenged, abandoned children, and “fallen” women. In the terminology of the seventeenth century, a “general hospital” was an institution that took in old people, the ill, and the poor. Health care, by contrast, was dispensed at the Hôtel Dieu. Over time, the word hospital has come to mean a healthcare establishment, even though the word hospice has been used for a long time for a place where people with loss of autonomy are cared for. A general hospital was opened on the Pointe-à-Callière in 1692 through the generosity of François Charon de la Barre, who founded the community of the Brothers Hospitallers of the Cross and of Saint Joseph, called the Charon Brothers. Although the King was opposed to the creation of this new community, François Charon went to France to encourage young men to join the ranks of the Charon Brothers. He died in 1719, however, on his way back to New France. With the passing years, the community no longer recruited new members and dissipated itself in a number of undertakings that eventually led to its bankruptcy. After a lively dispute between Marguerite and the Intendant Bigot, who wanted to transfer the poor people of Montreal to the General Hospital of Quebec City, the community was at last recognized by King Louis XV. In June 1753, the King signed the Letters Patent of the community, and Marguerite, called the Widow Youville, officially became administrator of the General Hospital of Montreal. During that year, the Sisters devoted themselves entirely to the victims of a major smallpox epidemic. Since they were not cloistered, they could visit the afflicted. They even cared for the First Nations people in Oka. The First Nations people were grateful to the community and can be found listed among the benefactors who contributed to the rebuilding of the Hospital after the fire of 1765. At the Grey Nuns’, lodging and food were offered to as many people as they could receive. In exchange, all the able-bodied people worked. Some did the laundry, while others prepared the meals; others sewed clothing and tents and did other kinds of needlework for the parishes and the King’s stores. One day, Marguerite even welcomed Intendant Bigot while she was wearing her work clothes because she had been in the process of making candles. In addition to taking in the poor, Madame d’Youville received some ladies who paid for their board and benefited from the friendly hospitality that reigned in the house in spite of poverty. According to the Annals of the Grey Nuns, Marguerite’s goodness of heart and friendliness tempered the austerity of the place and made life at the General Hospital pleasant. The lowly tasks and hard work performed by the Sisters were punctuated by periods of spiritual reflection that accompanied them in the care they gave to the poor. The woman, who would henceforth be called Mother Youville lived a deep spirituality based on the love of the Eternal Father, a Father who is compassionate and loving to his children. She put her trust in Him and in Divine Providence. As Superior of the community, Marguerite instructed her novices in the importance of daily prayer which builds up trust in God the Father and allows one to surrender to his Providence. She taught the ways of charity which enable one to tolerate the faults of others and hope that ours will likewise be tolerated. One of the community’s rules concerned the Sisters’ clothing, which was designed by Marguerite d’Youville: “since you believe it would be advisable for all those who make up your house to be dressed uniformly” Once again, Marguerite surprised her contemporaries. Her Nun’s habit was not black like those of the other communities, but grey-beige, as a display of humility. Moreover, she did not wear a veil, but a kind of bonnet that was more practical for everyday work. Another trial awaited Marguerite. A terrible fire broke out in the city. Ever generous, she sent her people to help the victims only to find out shortly afterwards that the fire had spread to the hospital. They were able to get the boarders and some of their possessions out. Marguerite courageously had the Te Deum recited as an act of submission to the ways of Providence. She was certain that the hospital would never again be destroyed by fire, and this has proved to be the case. At the age of 64, she began rebuilding the hospital. If Marguerite d’Youville was a religious woman, she was also a business woman. In spite of the disastrous fire, she acquired several weeks later the seigneury of Châteauguay from one of her boarders, Marie-Anne de Lanoue. She saw the possibilities for the development of her mission by rebuilding the mill, sowing the fields, and planting apple trees to provide food for her people. Marie Marguerite Dufrost de la Jemmerais, the Widow Youville, died on 23 December 1771. As the Foundress of the Sisters of Charity of Montreal, the Grey Nuns, first Superior of the community, and administrator of the General Hospital of Montreal, Marguerite d’Youville left a firmly established charitable work at the time of her death. She is remembered as an extraordinary women, a person devoted to others, an unequalled administrator, and a “strong woman” who contributed to the quality of life of Montrealers during a very difficult time. After Mother d’Youville’s death, Thérèse Lemoine-Despins was elected Superior of the young community. The orphaned daughter of a wealthy family from Boucherville, she had been received by Marguerite d’Youville in 1739. Sister Despins continued the work of the Foundress by instituting a new book of rules that allowed the community to maintain the fervour and cohesion of this small society working among the poor. They found new ways of earning money: bookbinding, raising canaries, and making wax images, including “wax baby Jesuses” for the Christmas cribs of churches. Thérèse-Geneviève Coutlée succeeded Mother Lemoine-Despins in 1792. Recognized as a outstanding administrator, Sister Coutlée definitely ensured the continuity of the mission. From the time of her entry into the community, “her sense of order and her understanding of household management” attracted the attention of Mother d’Youville. Mother Coutlée was also known for her embroideries, some of which have been preserved by the Grey Nuns. In 1804, the Maugras sisters, nieces of Mother d’Youville, bequeathed some apartments in the hospital that they had renovated at their own expense and where they lived out their lives to be transformed into an infirmary for the older Sisters. Sister Coutlée also promoted the creation of an asylum in one of the sections of the hospital. She related her memories to Father Antoine Sattin who wrote Vie de Madame Youville (Life of Mother Youville) in 1829. 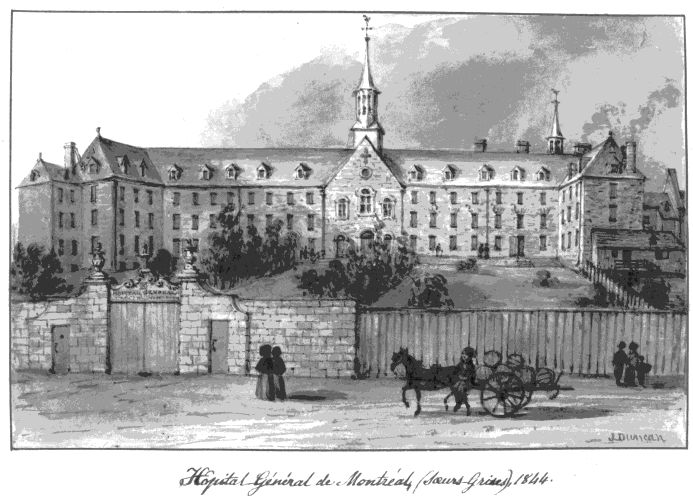 The 1840s were a decade of notable growth for The Grey Nuns of Montreal. Economic conditions were improving, the population of Canada was growing with the arrival of immigrants from the United Kingdom, and new means of transportation were developed. Faced with this situation, the bishops from other dioceses appealed to the spiritual daughters of Marguerite d’Youville and her now century-old charitable work. Each time, the administrators of the community hesitated because their numbers were still small, but the appeals were urgent. 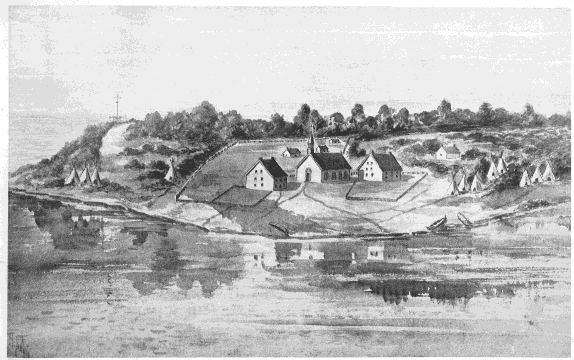 In the aftermath of the Patriotes’ uprising in 1837-1838, many people around the small town of Saint Hyacinthe found themselves without resources. The parish priest Edouard Crevier decided to build a hospice, “a modest two-storey wooden structure”, and asked The Grey Nuns of Montreal to administer it. The Sisters’ meeting in Council resolved to send four “subjects”. These Sisters had to volunteer their services because the community did not wish to force anyone to leave Montreal for the new mission.Sister Marie-Michelle-Archange Thuot, a nurse, pharmacist, and later Novice Mistress, and Sisters Marie-Émilie Jauron, Honorine Pinsonneault, and Marie-Tharsile Guyon volunteered for this new foundation. It was agreed from the beginning that this new house would be independent but adhere to the Rule of The Grey Nuns of Montreal. The Sisters arrived in May 1840 and took possession of the small Hôtel Dieu, also called the “Yellow House”. At the beginning, they were very poor, but gradually the Sisters of Charity of Saint Hyacinthe profited from the recognition of numerous benefactors, including The Grey Nuns of Montreal. 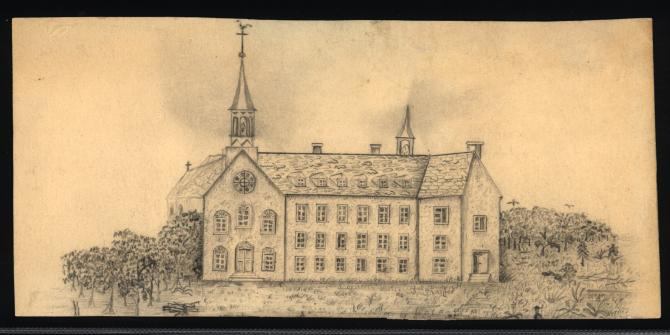 The Grey Nuns in Bytown (Ottawa), 1845In 1845, the city of Ottawa, also called Bytown, was only 18 years old. Immigration was increasing and the needs of the population were growing correspondingly. The bishops called on the charity and generosity of the Grey Nuns once again to found another institution. Sister Elisabeth Bruyère, 27 years old, was appointed Superior. From the time of their arrival in the heart of winter, the five foundresses—Sister Élisabeth Bruyère; Sister Eléonore Thibodeau; Sister Antoinette Howard, called Sister Rodriguez; and Sister Ursule Charlebois—moved quickly into action and soon they received the decree that created the Sisters of Charity of Ottawa, an autonomous community of The Grey Nuns of Montreal.Over the years, the Sisters of Charity of Ottawa have established more than 60 institutions for seniors, orphans, and sick people. Two groups of Sisters detached themselves from the Sisters of Charity of Ottawa to form autonomous congregations: the Grey Nuns of the Sacred Heart in Philadelphia in the United States in 1921, and the Grey Sisters of the Immaculate Conception in Pembroke, Ontario, in 1926. The Grey Nuns of Quebec, 1849The Annals of the Grey Nuns describe the situation in Quebec City in 1849 thus: “The old city of Quebec had already been sorely tried by disastrous fires, the plague of typhus, and now by another epidemic, that of cholera.” Archbishop Turgeon had thought of having a community come from France, but he was advised instead to turn to The Grey Nuns of Montreal to found a new Institute: The Sisters of Charity of Quebec. Land close to that of the Charitable Society of Catholic Ladies had been purchased for this purpose.The administrators appointed Sister Marcelle Mallet, who had been professed for 23 years, and Sisters Eulalie Perrin; Julie Pilon, called Ste-Croix; Elmire Clément; and Perpétue Thériault, as well as a young Irish novice, Alice Dunn. They left Montreal in August on the steamboat that linked the two cities. Their Sisters trembled at the thought of the terrible epidemic they were braving. The Sisters were nonetheless welcomed warmly in Quebec, where on the day after their arrival they found themselves responsible for 25 orphaned girls. Two weeks later, the number of orphans had doubled with the arrival of children whose parents had died of cholera. Gradually, more orphanages, schools, boarding schools, hospitals, hospices, and shelters were opened. In April 1844, four Grey Nuns left Montreal by boat for the Red River mission in what is today Saint Boniface, Manitoba. Sister Marie-Louise Valade, Superior, and Sister Eulalie Lagrave, along with Sisters Gertrude Coutlée and Hedwidge Lafrance arrived there on 21 June. They provided considerable help by teaching, caring for the sick, and comforting the poor of this isolated population. Education was offered to young girls and boys, including the Sauteux, Métis, and Sioux. A charming anecdote tells that Sister Lagrave possessed a lovely voice and was quickly asked “to sing her beautiful songs”. She became the lead singer at the cathedral while, at the same time, being the first “doctor” in the region, where she did her rounds by cart or sleigh. From their arrival at the Red River Colony on 21 June 1844, the Grey Nuns devoted themselves to care for the sick, the poor, the elderly and the orphans. Despite their limited resources, they built in 1871, a small house to care for the sick with a four-bed dispensary on the 2nd floor. This house was the foundation for what became the first hospital in Western Canada, the Saint Boniface Hospital. In 1847, the Grey Nuns came to the rescue of Irish immigrants suffering from the typhus epidemic. These immigrants arrived already afflicted with the disease and were quarantined in “sheds” in Pointe Saint Charles. That same year, four Grey Nuns died from the disease. It was from this time that the Grey Nuns developed their professional expertise not only in nursing, but also in management and pharmacy, among other things. In 1855, the parish priest of Toledo, Father Auguste Campion, Vicar General of Cleveland, Ohio, came to Montreal to ask Grey Nuns to found a charitable institution in his parish. Sisters Henriette Blondin, Thérèse Brady, Jane Hickey, and Suzanne Monarque went to Ohio in the autumn and quickly took charge of twelve orphan girls whom they had at first to clothe with their own garments. Two institutions came out of this mission: Saint Vincent’s Hospital and Saint Anthony’s Orphanage. An orphanage and a healthcare centre were opened in Lawrence, Massachusetts in 1868. A new Superior General, Mother Praxède Filiatrault, acquiesced in 1888 to the request of Bishop Williams of Boston to create an institute that would house and watch over the young girls who laboured in that city’s workshops and factories, hence the name of the new establishment, Working Girls’ or Saint Helena’s Home. In 1899, an extension of the first house, Saint Joseph’s Home, provided a residence for young black working women and immigrant women. Other establishments of the Grey Nuns were opened in the United States, including those in Minneapolis and Worcester, where the use of French was maintained. From Ohio to Massachusetts, from New Hampshire to New Jersey, the Grey Nuns founded healthcare and teaching establishments that made a difference to the local population. In 1953, in Lexington near Boston, the Sisters established the Maryvale Rest Home and the Lexington Academy of the Holy Family. In 1859, Bishop Alexandre Taché, who had invited the Grey Nuns to Saint Boniface, asked for Sisters to found a mission at Lac Sainte Anne, located in what is today Alberta. Three young Sisters were selected for the new mission. The administrators in Montreal were relying on the good health and good spirits of Sisters Zoé Leblanc, Adèle Lamy, and Marie Jacques to assist the missionary Oblates of Mary Immaculate. Scarcely arrived, Sister Zoé Leblanc, “the region’s great doctor”, opened a dispensary where she offered her best care and her smile. At that time, Father Albert Lacombe, OMI, was a missionary with the people of those regions, who were mostly First Nations people and Métis. When the Sisters arrived, they set themselves to learning Cree and, by doing so, helped to improve the situation of the sick people whom they visited in their tents with food and medicine. The Sisters also assumed the task of teaching the young. In 1862, Bishop Taché, who was on a pastoral visitation to Lac Sainte Anne, and Father Lacombe chose a new site for the Sisters’ establishment, namely, the Saint Albert Mission on the Sturgeon River, near Edmonton. Soon after, the Sisters were providing refuge to the elderly, orphans, and the sick for both the families of the region and the First Nations people. People of different nationalities and religions were also arriving there. For the historian Janet Ross-Kerr, the year 1859 marks the beginning of nursing in Alberta. She states: “The Grey Nuns brought with them their traditions of competence, independence, self-sufficiency, and determination.” The missions founded by The Grey Nuns of Montreal in the Canadian West remained under the administration of the Congregation in Montreal. Three Grey Nuns arrived at the Mission of Saint John the Baptist in Île-à-la-Crosse in 1860. This place in northern Saskatchewan also has a Métis name that translates the Cree name Sakittawak, meaning “the place where two waters meet”. Sisters Rose Caron, Superior, Philomène Boucher, and Marie-Anne Pépin were all under 30 years old. They valiantly founded the first of many missions that would spread right up to the shores of the Arctic Ocean. The Montreal General Hospital, which was located close to the Saint Lawrence River, was frequently subject to spring flooding. On 14 April 1861, the waters rose as high as the first floor. This flood convinced the community’s administrators to buy a plot of land in the countryside at Mont Sainte Croix, which is situated today on the corner of Guy Street and René Lévesque Boulevard in Montreal. It 1868, the community decided to build a new Mother House there. In October 1871, under the leadership of Mother Jane Slocombe, the Sisters moved into the huge building that became the Mother House of The Grey Nuns of Montreal. The mortal remains of the Foundress were reverently transferred there. Following this, the elderly residing at the hospital were moved, followed by the older Sisters who left the old house in Pointe-à-Callière with a certain amount of regret for its 124 years of traditions and humble labours for the sake of the poor. The old General Hospital became a warehouse in the port of Montreal. The prestigious architect Victor Bourgeau, one of the founders of the Montreal Academy of Fine Arts, was hired to bring to life this ambitious project. Other architects contributed to various stages of the construction of the Mother House: Joseph Venne, Alphonse Piché, and Maurice Payette. In his original plans, Victor Bourgeau proposed a convent arranged in the form of the letter H with a chapel at its centre. The east side (the Guy Street wing) would house the community while the west side (the St. Matthew Street wing) would be for the old people, the ill, and orphans. The completion of the project, which extended over several decades, did not exactly follow Bourgeau’s plans, but it resulted in an exterior appearance very much in keeping with his design. The convent as a whole is of an extraordinary quality and integrity, owing to its continuous occupation by the community. In 1974, the chapel of the Invention of the Holy Cross was declared a historical monument, as was the entire convent of the Grey Nuns in 1976 by Quebec’s Cultural Property Act. In 1995-1996, the chapel was completely renovated. The color of the original walls, pews, and floors was restored, and the mouldings on the ceiling and vault were refurbished. In 2007, in spite of everything this house meant to them, The Grey Nuns of Montreal, coming to the sad realization that their diminishing numbers would not be replenished, decided with clarity and serenity to sell the Mother House to Concordia University. In 1886, four members of the Sisters of Charity of Saint Hyacinthe went to Nicolet to found the Hôtel Dieu of the Sisters of Charity of Nicolet. Sister Aurélie Crépeau, whose religious name was Sister Youville, was their first superior. She was accompanied by Sister Saint Jean de Dieu (Hermine Bernard), Sister Saint Eusèbe (Zéphirine Brodeur), and Sister du Sacré-Cœur (Octavie Beaulieu). From the time of their arrival, they took charge of a provisional residence for the care of the sick; afterwards, they moved into the new building of Nicolet’s Hôtel Dieu. Like other communities of the Grey Nuns, they sent some of their members to Western Canada, especially to help the First Nations people, the Blackfoot, Blood, and Peigan tribes in southern Saskatchewan and Alberta. In 1941, the Sisters of Charity of the Hôtel Dieu of Nicolet, still active in that city, elected to merge with The Grey Nuns of Montreal. In 1912, the mission of the Grey Nuns numbered 1,010 Sisters affiliated with 68 establishments. In Quebec, there were 27 institutions, hospices, hospitals, homes, and boarding schools. In Manitoba, there were ten, three in Saskatchewan, two in Ontario, and eight in Alberta. Twenty-six establishments had been opened in the United States. The Superior General, Mother Anna Piché, headed a Council of twelve Sisters, as had been set by the Letters Patent of 1753. Among other activities, she visited in that year the missions in the West to become familiar with their life. The First World War affected the work of the Grey Nuns, but nevertheless some projects were realized. The orphanage and the crèche were moved from the Mother House to Côte-de- Liesse. The Annals emphasize that 300 orphans “benefited from life in the country”. A number of Sisters succumbed to the Spanish flu of 1918, including Sister Saint Mathias, the Executive Director of Notre Dame Hospital. The war resulted in intensification of needs since many people were orphaned or had become invalids. Doctor J.-Ernest Gendreau founded the Radium Institute in Montreal in 1921 under the aegis of the University of Montreal. In Paris, he had studied the properties of radium with the Curie and wanted to use it to overcome the devastation wreaked by cancer in the population. In 1927, the Grey Nuns agreed to be responsible for the internal administration of the Institute. The stock market crash of 1929 hit the city of Montreal hard. The Grey Nuns were once again on the front lines. They distributed food to families. They also provided social services in households by giving advice and practical information on nutrition, hygiene, and home management. In a way, they conducted a mobile home economics school. The Mother House on Guy Street housed a novitiate, an old people’s home, and a home economics school. Since the beginning of their work, the Grey Nuns had been concerned about the quality of care for sick people. Since 1896, they had had a school for nurses in Toledo as part of their mission in Ohio. A similar school was opened in 1898 in Montreal at Notre Dame Hospital. Its foundress was Sister Élodie Mailloux. From 1921, Mother Virginie Allaire, American by birth, and Sisters Fafard (Mathilda Toupin) and Duckett (Albertine Pépin) promoted advanced training for nurses in collaboration with the University of Montreal. Several Sisters had received a university education in the United States. In 1934, the University of Montreal’s Faculty of Medicine agreed to the founding of an advanced nursing school to be called the Marguerite d’Youville Institute, Advanced School of Nursing. The Institute was first located in Montreal in the Saint Matthew wing of the Mother House of the Grey Nuns on René Lévesque Boulevard. Until 1954, it was the only French-language advanced nursing school in Quebec. At the beginning of the 1960s the Institute moved into new quarters financed completely by the Grey Nuns on Côte Ste. Catherine Road. Then, in 1967, the Marguerite d’Youville Institute merged with the Faculty of Nursing (created in 1962) and was integrated into the University of Montreal. An Acadian, Mother Évangéline Gallant, presided over The Grey Nuns of Montreal during the Second World War. The third centennial of the city of Montreal was celebrated with faith and gratitude in 1941. A Mass was broadcast on the radio, and it was proclaimed that “the year will be dedicated to the memory of the founders of this city and to the commemoration of their heroism and virtues”. Marguerite d’Youville, who had taken charge of the General Hospital 200 years earlier, in 1747, naturally came to mind. In April of 1957, four Grey Nuns from the Nicolet community—Sisters Lucille Ratté, Lucille Chamberland, Marie-Étienne Lemire, and Flore Poirier—“agreed to go to devote themselves to the mission under the Brazilian sun”. They had been asked to do so by the parish priest of Alcantara, Father Georges-Émile Picard, who was originally from Nicolet. The Irmas de Caridade worked in the Santa Casa d’Alcantara dispensary in northeastern Brazil. Later, the Grey Nuns offered health and education services in the cities of Guimaraës, São Paulo, Chapadinha, and São Luis. All the missions of the Grey Nuns in Brazil have been oriented to helping the needy by providing them with health care. The Grey Nuns have worked in little hospitals and dispensaries. They have also given training on hygiene and the prevention of diseases to the mothers of families. Today, the Brazilian Sisters continue the work of Marguerite d’Youville in their country. In May 1959, fifty-four Grey Nuns journeyed to Rome for the beatification of Marguerite d’Youville. This remarkable event united seven thousand Grey Nuns throughout the world. The following year the Sisters gathered in Varennes, Quebec, the village where Marguerite d’Youville was born, for a major celebration with its citizens. The first years of the new decade were busy with the preparations for the Second Vatican Council that would change many practices at the core of the Catholic Church. From the 1960s, The Grey Nuns of Montreal received requests from a number of bishops who wanted them to help improve health care, education, and social development among the various nations of Africa. Between 1963 and 1977, a number of Sisters who were trained nurses worked in Tunis. They were involved in setting up a 300-bed children’s hospital in association with the Tunisian Ministry of Public Health. Sister Huguette Allard, already a nurse when she arrived there in 1969, became the clinical instructor and then the coordinator of the pediatrics programme of Tunisia’s National School of Public Health. She subsequently headed the Tunisian-Canadian cooperative health project. In 1971, five Grey Nuns—Sisters Nicole Fournier, Christiane Beaulieu, Ghislaine Desjardins, Estelle Tardif, and Rina Tardif—travelled to northern Cameroon. At the college of Mazenod, located in N’Gaoundéré, they helped to increase the level of education of the local population who were lagging behind the people living in the south in this regard. This teaching mission continued until 1984. In 1975, the Grey Nuns responded to the request of Bishop Louis Charpenet of Yagoua to work in the dispensary of his diocese in order to fight infant mortality and epidemics of measles and meningitis. The Sisters were also mandated to provide health education and social improvement instruction, especially for women. Between 1969 and 1973, the Grey Nuns taught at the Girls’ College of Egbe, Nigeria. The first Sisters to work there were Sister Claudette Dionne, who served as Principal of the College, and Sister Dolorès Blanchard, who was a teacher. In 1971, The Grey Nuns of Montreal also agreed to open a mission in Dungu, Zaire, and to take charge of a school for nurses and midwives. Ten Sisters went to work in this Medical Technical Institute until 1986. Three Grey Nuns of Montreal from the canonical province of St. Joseph left the United States in December 1978 to go to Bogota, Colombia. Sisters Alice Moran, Laura Rabida, and Marion Connelly were going to provide reinforcements for Señora Mercedes Rosario de Martinez who had started FANA, the Foundation for the Adoption of Abandoned Children, in Bogota in 1971. A home for teenage mothers was quickly added to this work. In 1988, the Sisters opened the Marguerite House in La Parada on the border between Colombia and Venezuela. As nurses or teachers, the missionary Sisters in Colombia drew inspiration in their daily work from the charity of Marguerite d’Youville. On 31 December, the mission in Columbia was permanently closed. Today the youvillian mission is continued by Associates of Saint Marguerite d’Youville. In 1980, the building of the old General Hospital, an important landmark of Montreal’s heritage, was completely renovated by the Grey Nuns. They moved back to the old Hospital which now houses the administrative center of the congregation, the congregation’s Archives, and a permanent exhibition, In the Footsteps of Marguerite d’Youville, which was installed there in 2004. This exhibition allows visitors to see various rooms of the old hospital where a number of original artifacts are displayed as well as some objects that belonged to Marguerite d’Youville: one of her account books, some of her letters, and the painting of the Eternal Father that was in the room where she died in 1771. Following the sale of the Mother House, the Grey Nuns decided to entrust the Mortal Remains of Saint Marguerite d’Youville to the Christian community of her native parish of Saint Anne in Varennes on the south shore of the Saint Lawrence River. In December 2010, Marguerite was entombed in the chapel of the Basilica. Her tomb has become a place of prayer and contemplation open to everyone. An exhibition located in the former sanctuary next to the church recounts the life of this extraordinary woman.